The United States warned North Korea’s leadership it would be “utterly destroyed” if war were to break out after Pyongyang test-fired its most advanced missile, putting the U.S. mainland within range, in violation of UN Security Council resolutions. The Trump administration has repeatedly said all options are on the table in dealing with North Korea’s ballistic and nuclear weapons programs, including military ones, but that it still prefers a diplomatic option. Speaking at an emergency UN Security Council meeting, U.S. ambassador Nikki Haley said the United States had never sought war with North Korea. Haley said the United States has asked China to cut off oil supply to North Korea, a drastic step that Beijing — the North’s neighbour and sole major trading partner — has so far refrained from doing. Previous U.S. administrations have failed to stop North Korea from developing nuclear weapons and a sophisticated missile program. Trump, who has previously said the United States would “totally destroy” North Korea if necessary to protect itself and its allies from the nuclear threat, has also struggled to contain Pyongyang since he came to office in January. Urging China to use its leverage and promising more sanctions against North Korea are two strategies that have borne little fruit so far. In a speech in Missouri about taxes, Trump, who has traded insults with the North in the past, referred to North Korean leader Kim Jong-un with a derisive nickname. “Little Rocket Man. He is a sick puppy,” Trump said. North Korea, which conducted its sixth and largest nuclear bomb test in September, has tested dozens of ballistic missiles under Kim’s leadership. Pyongyang has said its weapons programs are a necessary defence against U.S. plans to invade. The United States, which has 28,500 troops in South Korea as a legacy of the 1950-53 Korean War, denies any such intention. North Korean state media said on Wednesday the intercontinental ballistic missile (ICBM) was launched from a newly developed vehicle in a “breakthrough” and that the warhead could withstand the pressure of re-entering the atmosphere. Kim personally guided the missile test and said the new launcher was “impeccable”. Pyongyang claimed it had “finally realized the great historic cause of completing the state nuclear force”. Russian Foreign Minister Sergei Lavrov said on Thursday that Moscow took a negative view of a U.S. call for all countries to cut ties with North Korea because of its ballistic missile programme, Russian news agencies reported. Lavrov, speaking in Belarus, was responding after Haley said on Wednesday that all countries should sever all ties with Pyongyang, including cutting trade links and expelling North Korean workers. Russia isn’t the only nation to suggest that the U.S. is taking the wrong approach with North Korea. The official China Daily newspaper said in an editorial that the latest launch may have been prompted by the Trump administration’s decision to label North Korea a sponsor of state terrorism. Beijing wants the two “belligerents” to calm down and is vexed that a golden opportunity to encourage Pyongyang into talks was “casually wasted” by the Trump administration, the paper said. “The clock is ticking down to one of two choices: learning to live with the DPRK having nuclear weapons or triggering a tripwire to the worst-case scenario,” it added. North Korea said the new missile soared to an altitude of about 4,475 km — more than 10 times the height of the International Space Station — and flew 950 km during its 53-minute flight. It flew higher and longer than any North Korean missile before, landing in the sea near Japan. 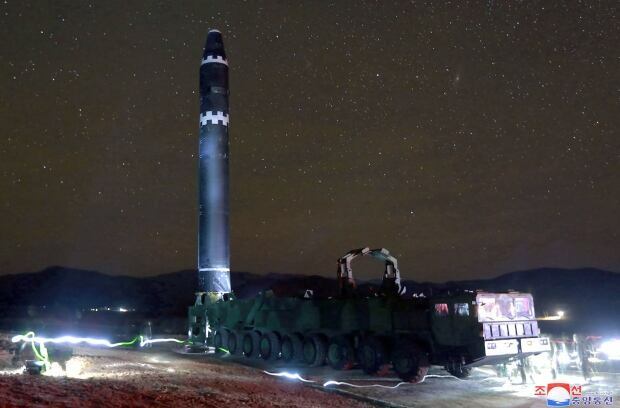 Photos released by North Korean state media appeared to show a missile being positioned on the launch site by a mobile vehicle, designed to allow the missile to be fired from a wider number of areas to prevent it being intercepted before launch. 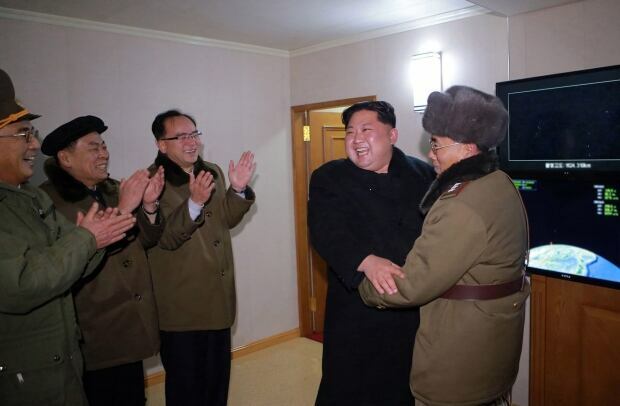 Kim is shown laughing and smiling with officials both next to the missile as it is readied, and in a control booth. The launch itself shows the missile lifting off amid smoke and fire, with Kim watching from a field in the distance. U.S. intelligence analysts have concluded from satellite and other data that the test missile was fired from a fixed position, not a mobile launcher, three U.S. officials said. One official said the test appears to demonstrate a more powerful North Korean solid-fuel propulsion system, especially in its second-stage rocket. The photos also revealed a larger diameter missile, which could allow it to carry a larger warhead and use a more powerful engine, said David Wright of the Union of Concerned Scientists, a U.S.-based nonprofit science advocacy group. Three U.S. intelligence analysts said they were trying to assess whether North Korea’s comments meant Kim might now be open to a longer halt in testing in order to reopen negotiations that might help prevent, or at least defer, the imposition of additional sanctions. The officials also noted, however, that North Korea has not proved it has an accurate guidance system for an ICBM or a re-entry vehicle capable of carrying a nuclear warhead and surviving a return from space through Earth’s atmosphere, meaning further tests would be needed. An international meeting in Canada in January is designed to produce “better ideas” to ease tensions over Pyongyang’s nuclear and ballistic missile tests, Canadian officials said on Wednesday, although North Korea itself will not be invited. U.S. Secretary of State Rex Tillerson said on Wednesday the United States has “a long list of additional potential sanctions, some of which involve potential financial institutions, and the Treasury Department will be announcing those when they’re ready to roll those out”. In just three months, South Korea hosts the Winter Olympics at a resort just 80 kilometres from the heavily fortified border with North Korea.